TM!R OVA 4 Coming Autumn 2016! Posted on Monday, May 2nd, 2016 at 18:53. Well, as most of you probably already know by now, OVA 4 episode 1 will come out in the autumn of 2016. The first piece of promo art is out now, courtesy of the official Japanese OVA 4 site. 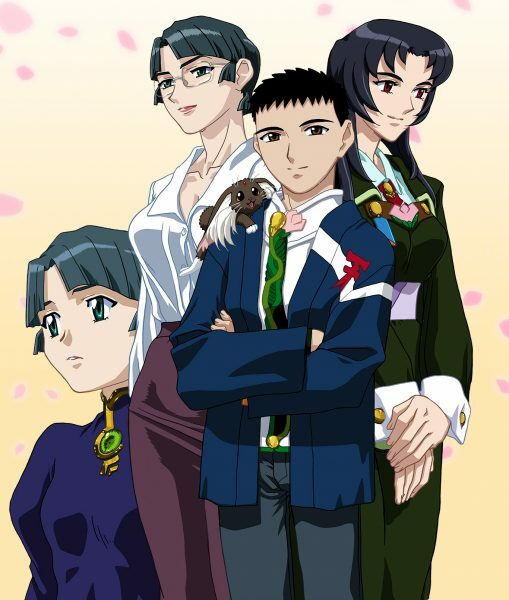 From left to right, we have a young Rea (Tenchi’s step mom and the mother of Kenshi from War on Geminar), adult Rea, Ryo-chan, Tenchi, and Minaho. It really intrigues me that Minaho is in the first promo art. She had more of a role in GXP and only a cameo in OVA 3. It would be interesting if OVA 4 helped flesh her character out more. Seems they’re using Aeka’s new VA from the Ai Tenchi Muyo series. I didn’t realize until just now that Yumi Takada retired back in 2009. Anywho, I can’t believe it’s already been almost 16 years since Tenchi first premiered on Toonami. The first two anime DVDs I bought were Tenchi Forever and the Tenchi OVA box set back in 2001. Good to see that Kajishima-sensei is still keeping the story going after 24 years. Aeka’s new seiyuu did a good job in Ai Tenchi Muyo, so I’m good there. 🙂 And yeah, it is hard to believe it has been this many years since TM!R first landed. Since it’s showing Reia, I wonder if its going to go into any of the training they put Kenshi through before they booted him to Geminar. Or if its just gonna flesh out her history a bit? Either way, I look forward to it! It would be nice to get more info on Rea and on the whole issue of sending Kenshi to Geminar, especially since Tenchi’s harem was involved in training Kenshi. About the poster: I do hope that Minaho gets a little more spotlight in the new story. As well Tenchi’s outer space relatives (Airi-san *_*) maybe the Academy (not just the GP parts). With this being an OVA, I highly doubt we’ll get an official simulpub from anyone. But, as you said, hopefully someone will do the series. If the series takes place before Kenshi is sent to Geminar, , Tenchi is going to have children. I suspect that OVA 4 will take sometime after GXP. For OVA 4, I do want it to be a sequel to the RYO-OHKI series. Still, I am only expecting is Tenchi being a ronin, Sasami going to school, and finding out about the name of the town near the Masaki Shrine. We’ll see, but I strongly suspect the -If- doujinshi were created in storyboard form specifically for OVA 4. Sigh, I hoped for 6 + 1 additional like before. And still hope for that. The release gap between the episodes is similar to those of the previous OVAs, so it’s OK, I guess. Anyway, I’ll try to wait for all episodes to come out and then watch it. Waiting for 3 months after every episode would be too painful, especially if cliffhangers get involved. P.S. AstroBoy, could you do the review for GXP and War on Geminar series before the OVA 4 is released (or finished)? Thanks for the info. I’m really shocked at only four episodes, but that could always expand. After all, +1 was an expansion of the originally approved six episodes. AstroBoy, could you do the review for GXP and War on Geminar series before the OVA 4 is released (or finished)? Well, I was hoping for more on Mihoshi and perhaps something to connect the universe to Dual!, but I’ll take what I can get when it comes to OVA-compliant series. Yeah, getting Mihoshi’s backstory would be nice. I sometimes think that Kajishima is a bigger tease that Shirow. 😆 Yeah, he is a tease. It may only be 4 episodes, but they might be pretty long (big hope), like hour long or more. War on Geminar was OVA with 45 min ep. And it’s not Kajishima who’s teasing. The studio makes the decisions about length. Otherwise he’s stated he would do way more. Originally, War on Geminar was set up as a TV series (as I understand it), but then it got switched to OVA, so they just merged two episodes into 1.